Hannibal Barca is regarded as one of the great military commanders of the Western world, a status which is a little surprising considering that he never actually defeated his great opponent Rome in a war. Part of this honor is undoubtedly due to his success in battle, as in a succession of victories his outnumbered forces defeated the Roman legions sent out to destroy them. Yet Patrick Hunt's new biography of the Carthaginian general points to another reason why he holds such an exalted status, as his success ironically helped the Romans to become the dominant empire we remember it as today. This, of course, was not Hannibal's goal when he set out to destroy Rome in 218. The son of a Carthaginian statesman who led his country's forces in the First Punic War, Hannibal made revenge the main focus of his life. His achievements in this regard were nothing short of remarkable, as he led his men on a grueling march through the Alps into often hostile territory, where through brilliant generalship and a shrewd exploitation of Celtic grievances he repeatedly bested the troops sent by Rome to defeat them. Yet rather than surrender, Rome adapted by adjusting their leadership structure and adopting a strategy of attrition, trapping Hannibal in a war he couldn't bring to a resolution, The culmination came in the battle of Zama in 202, when Hannibal found the situation neatly reversed, as his untrained army was defeated by the better-managed legions of Scipio Africanus, who used some of Hannibal's own tactics against him in order to win. 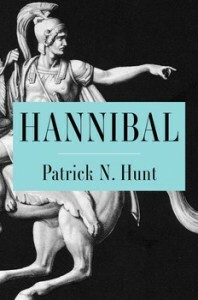 Hunt's book offers a knowledgeable overview of Hannibal's life and times. This is no small achievement considering the paucity of sources and their bias -- the only historical sources on Hannibal are Roman ones, with all of the problems that this entails. Often this has the effect of turning his book into more of a history of the Second Punic War than a biography, but the advantage of this is that it highlights what is Hannibal's greatest contribution to history. For while he may not have succeeded in defeating Rome, he became its greatest teacher of the military arts and helped to make them into the empire that would endure for seven centuries and more. This alone makes Hannibal well worth reading about.